Hello December! I love Christmas. I have many happy memories in past Decembers involving celebrating birthdays, yummy food, cheerful Christmas decorations and family fun. We got our Christmas tree last week so it was time to pull out the Christmas boxes from under the stairs. I love re-discovering Christmas items that I have forgotten in the last year but I think the person that was most excited was my daughter. Very quickly my living room floor was covered in Christmas decorations, craft supplies, and Christmas cards. I had forgotten how many Christmas craft kits I purchased the last couple years. I have decided on a new goal that this year we are going have hours of crafting fun and use up the craft supplies so very little is put back in storage at the end of the Christmas season. We will enjoy buying a few next craft kits next year. My truly special ornaments (or babbles) are still stored in the USA at my parents home. 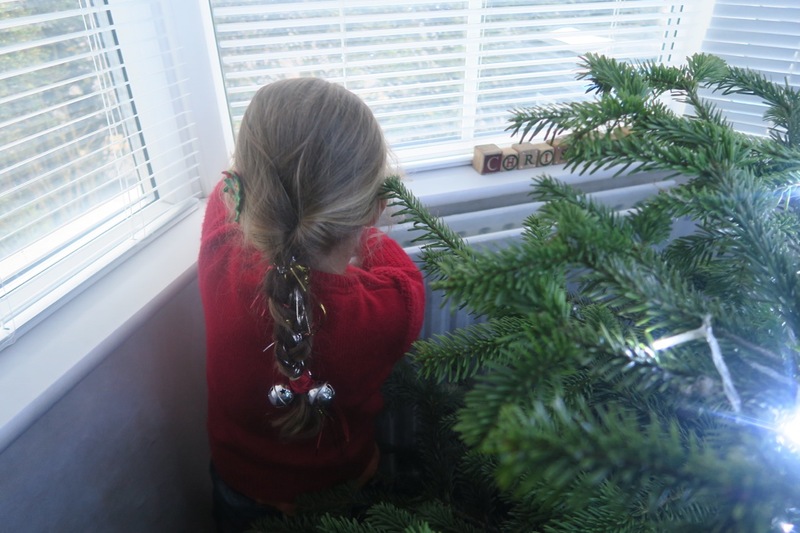 In the next couple years when my children are a little older and less likely to pull the glass ornaments off the tree, I will have the "Christmas box" sent to England. Our current tree decorations are made up of plastic metallic and glitter ornaments with a few bead garlands. My daughter has handmade felt ornaments for her tree and Little Brother has inherited handmade wooden planes that were made by my father and grandfather before I was born. Thank you for everyone that joined us last week for Share the Joy. We are all enjoying your blog posts. Share the Joy is the happiness-focused linky. Bloggers, writers, artists, poets, if creating something made you laugh out loud, opened your heart, raised your spirits or just made you smile – you’re welcome here. 1) Link up a creation that has brought you JOY – all genres are welcome, new or old favourites and as many links as you like! 2) Include the Share the Joy badge (below) or a text link back to this page in your own post. 3) Please comment on one of our hosts’ posts and a few others. Let’s Share the JOY through commenting! A new "Share the Joy" linky every Monday and runs for a whole week, so you’ll never be too late. 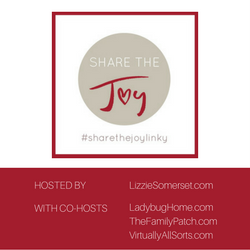 And don’t forget to tweet me @LadybugHome1 and also @lizzie_roles , @AllSortsHere and @TheFamilyPatch the URL to your post using the hashtag #ShareTheJoyLinky so we can retweet it. Feel free to invite your friends to join in – JOY is always better when it’s shared! Head over to Lizzie's blog, Lizzie Somerset to link up this week. Thank you to everyone that linked up last week! I hope you have a week filled with joy!